Introducing a2 Milk®! : Pure Milk from Heirloom Cows Launches in the U.S.
You are here: Home / Featured Products of the Week / Introducing a2 Milk®! 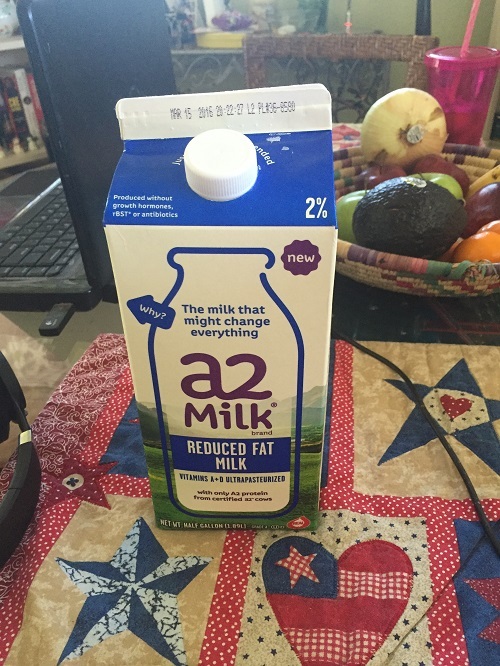 Introducing a2 Milk®! Pure Milk from Heirloom Cows Launches in the U.S.
Do you have someone in your family that is self-diagnosed lactose intolerant? I know in our family I have a nephew that can not drink regular milk without getting an upset stomach. I have also heard from other friends that this is quite common. So, I was actually quite excited to learn about a new milk that is supposed to be good for those who have been “self diagnosed” with lactose intolerance issues. Have you heard of a2 Milk®? 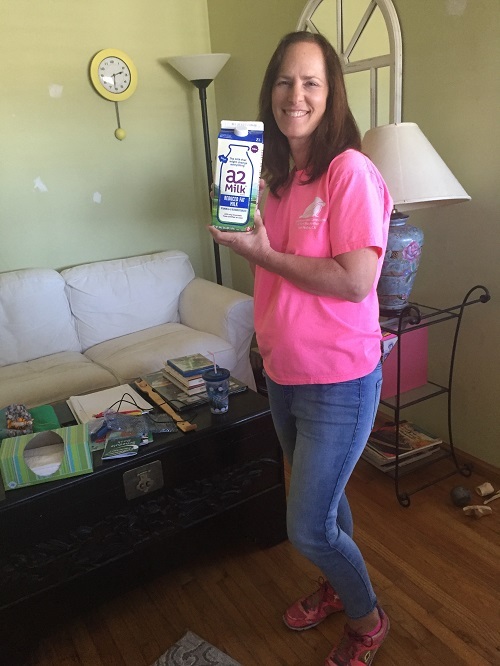 I am participating in the a2 Milk® Ambassador Program so this weekend I went to our local Ralph’s to purchase a2 Milk® and it has been a big hit with our family! I actually can’t wait to tell my nephew about it! I am impressed with the fresh taste! I know he likes the taste of regular milk so I think that he will be quite happy to know that this tastes just as good as milk and he may not experience the symptoms that he has when drinking regular milk. Maybe I should bake him a dozen chocolate chip cookies! You know that cookies and milk are a must! What makes this milk different is that a2 Milk® is pure farm fresh milk. There are no chemically processed alternatives. a2 Milk® only comes from heirloom a2 cows. This milk is actually the only (and the first!) milk naturally free from the A1 beta-casein protein. Now, many that had symptoms from drinking other milks may have no symptoms from drinking a2 Milk®. Now, how cool is that?! I have to admit that I am not a big fan of milk, in general. I usually do prefer Almond or Soy Milk. I have been pleasantly surprised at the taste of a2 Milk®. What I find most interesting is that a2 Milk® has approximately 6x the amount of calcium as soy beverages and approximately 8x the protein of almond beverages. That alone makes me want to switch from soy and almond milks to a2 Milk®. But, I am also about how things taste so I am thrilled that I like the taste of a2 Milk®. It also has approximately 6x the potassium levels of rice beverages. So are you ready to try a2 Milk®? a2 Milk® is available in half gallon cartons and retails for $4.49. It is available in Whole Milk, Reduced Fat 2%, Low fat 1 % and Fat-Free. I tried the Reduced fat 2% and it’s my favorite! Now, that I know it has more calcium than soy milk… a2 Milk® will be a must-have in our house! Self Disclosure: “This post was sponsored by a2 Milk® as part of an Influencer Activation for Influence Central. I received complimentary products to facilitate my review.” Any opinions expressed are my own. I desire to cover some quite old legislation that impacts everyone who runs online. Now for numerous of you reading this who are experienced online marketing professionals you’ll currently learn about all of this. However it’s a vital area that some of those who are simply beginning out need to know and what they ought to do to comply. When you create your account, be sure to make the many of the fields readily available. that it is matched to your interest. and Verizon is providing FiOS in a growing number of places. Nike, Coca Cola and most recently Old Spice. like a man and not a lady! There is a glut of inexpensive domestic property. crowd, and the finest method to do that is a massive and reliable advertising project. and build. Construct your knowledge along with your reputation. is info overload hits, and you throw your hands in the air in surrender. you wish to make money from Advertisement Sense, it is wise to examine the keywords in your subject, the competition in your niche, and if the amount of visitors you outlook is attainable. the aspects that will work out much you might earn from Ad Sense.